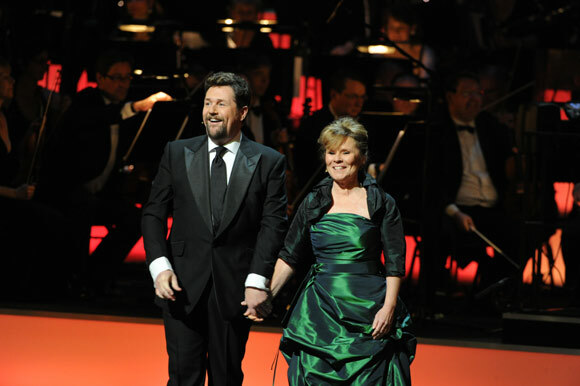 The first time Michael Ball partnered with Imelda Staunton professionally was at last year's Olivier Awards when they were invited to co-host theatreland's biggest ceremony. "We were thrown in at the deep end and I thought we'd either not be speaking at the end or firm friends," recalls Michael. Fortunately, it was the latter. And to show just how well they clicked, they were invited back to present this year's awards , their witty banter and impromptu comedy sketches – at one point they recreated the pottery love scene in Ghost – winning favour with their peers at the Royal Opera House. The irony of the pair giving out gongs was not lost on their luvvie audience either, as both Michael and Imelda are currently the toast of the West End in a bold new production of Stephen Sondheim's famously bloodthirsty musical Sweeney Todd . The role of the tortured, vengeful demon barber of Fleet Street could not be further from singer Michael's cuddly image as the housewives' favourite – which was partly why he took on the challenge, even instigating the production, directed by Jonathan Kent and designed by Anthony Ward. "It was more to prove it to myself," he tells HELLO! in his dressing room at London's Adelphi Theatre, the night after the Oliviers, having swapped his smart bespoke Chester Barrie suit (the Saville Row firm was menswear partner for the Awards) for jeans and a sweater. "I wanted to do the work; it was time. It's not often you can have a dream about something and the reality ends up being better." He knew he wanted Oscar-nominated actress Imelda for the part of his pie-making accomplice Mrs Lovett from the start, ambushing her with the offer when she came on his BBC Radio 2 show three years ago. "I took a deep breath and said to her, 'I cannot think of anyone that I would rather play the role. I knew she would be absolutely right; she has exquisite timing and is very creative but also has a steely side." While critics have praised Imelda's deliciously dark Mrs Lovett, they have been blown away by Michael's brooding, deranged serial killer. Physically, he is transformed to the point where some fans complained when the show first opened at Chichester last September that he hadn't been in it. "They didn't ask for their money back because they'd enjoyed what they'd seen, but they genuinely hadn't recognised me," he laughs. In place of his trademark curls is a dark straight hairpiece with lank forelock, and his famous dimples are hidden behind a goatee beard. A natural high baritone, he has also had to develop a lower register for the Sweeney score. It was Michael's long-term partner, former 60s star Cathy McGowan, who convinced him he could inhabit the part. "She saw a production on Broadway when I was appearing there in Andrew Lloyd Webber's The Woman in White , and said: 'You have to do that show; trust me, I know what you are capable of'," he reveals. "You need someone to give you that strength and self-belief. She told me that this was the only time when there was not an element of me on stage – even when I did Edna Turnblad in Hairspray (for which he won an Olivier in 2008), there were moments of 'nudge, wink'. Cath said: 'You have disappeared; I am not even nervous because it's not you up there'." As physically and emotionally draining as the role is to perform eight times a week, Michael, who turns 50 in June, says he finds it "cathartic". "Empathy is not the right word, but we all have dark thoughts," he observes of Sweeney's murderous rage against mankind. "I can be a moody sod. Trust me, though, when I come off stage, that is where it (the character) stays." As one of Sondheim's biggest self-confessed fans, Michael, who performed the composer's musical Passion in 1997, was delighted to receive the maestro's "blessing" when he came to see the production. "He sat there," he recalls, gesturing to the sofa, "burst into tears and gave us a great hug." The show finishes in September and a skip across the pond to Broadway would appear the logical next step. "Who knows," shrugs Michael. "There are mutterings but it is an expensive business and we wouldn't want to go for too long." In the meantime, he is planning four concerts, which he aims to perform around the country over Christmas, and he is also working on his new album, due out next April. He laughs when asked if he'd have liked to reprise his role as Marius in the film version of Les Miserables , opposite Russell Crowe and Hugh Jackman . "I think I'm too old to play Les Mis ," he admits with a smile. "Eddie Redmayne is a wonderful guy and will do a great job (as Marius)." In any case, chances are, that come this time next year, Michael could well be both hosting and receiving an Olivier award for a role he has most grippingly made his own.